Collisions involving commercial vehicles cause much more significant injuries and damage than those involving only passenger automobiles. When someone is involved in a collision with a commercial vehicle it is imperative that the contact an attorney immediately so that steps can be immediately undertaken to preserve and collect evidence. Since the first of August, there have been 15 serious wrecks involving 18-wheelers in the state of Texas. A total of 9 people were killed as a result of these wrecks, while many more were seriously hurt and millions of dollars in property damage was sustained. Below is a summary of the most serious wrecks. August 5th, 2015. Moody, TX– John Eric Singer, 35, of Hewitt, who was flown in critical condition to Scott & White Hospital in Temple after his SUV collided with an 18-wheeler was listed in serious condition Thursday after undergoing what authorities described as major surgery. Singer was left trapped in the wreckage of his SUV, which overturned in the collision with the 18-wheeler just before 4 p.m. Wednesday on State Highway 317 between McGregor and Moody. The 2007 Chevrolet Trailblazer was northbound when it drifted into the oncoming lane and collided with the southbound 18-wheeler, Department of Public Safety Trooper D.L. Wilson said. The driver, of the 18-wheeler, which was hauling crushed limestone, wasn’t injured, Wilson said. The highway was closed for several hours because of the accident. The cargo had be offloaded before the truck could be removed, Wilson said. August 12th, 2015. Chico, TX— A Bridgeport man was killed in a three-vehicle accident east of Chico Friday evening. Daniel Cordova-Acuna, 30, was southbound on Farm Road 1655 in a Mazda B series pickup about 7:40 p.m. when he ran the stop sign at the intersection of FM 1655 and FM 1810, according to Department of Public Safety Trooper Patrick Garcia. Cordova-Acuna ran into the path of an 18-wheeler eastbound on 1810. The 18-wheeler, driven by Jose Ramirez Garcia, 42, of Alto, hit the pickup and pushed it off the road before rolling onto its side and sliding into the westbound lane of FM 1810, where it was struck by an oncoming 2 1/2-ton military truck, also called a “deuce-and-a-half.” The pickup came to rest on the south side of FM 1810, and Cordova-Acuna was pronounced dead at the scene by Precinct 1 Justice of the Peace Jan Morrow. The 18-wheeler and military truck came to rest on the north side of FM 1810 after destroying a guard rail. Garcia was transported to Wise Regional Health System in Decatur, and the driver of the military truck, Colton Petty, 21, of Chico was flown to John Peter Smith Hospital in Fort Worth. He was listed in fair condition Tuesday. There were no passengers in any of the vehicles. August 13th, 2015. Houston, TX– A major accident involving a wrong way driver and an 18-wheeler shut down the 59 Eastex Freeway outbound lanes at Laura Koppe for several hours this morning. All lanes are back open. The crash happened just after 3:30am this morning. Police say a black pickup was going southbound in the northbound lanes of the Eastex Freeway. As it was going southbound, it struck an 18 wheeler going northbound in the correct lane of travel. As a result of the collision, the pickup truck driver died at the scene. The operator of the 18-wheeler was transported to a local area hospital with minor injuries. That driver is expected to survive. Witnesses also tell police they saw dump truck or a garbage type truck strike the back of the 18-wheeler after the crash. That driver left the scene. Police are still searching for that truck. August 15th, 2015. Denton, TX– Three people were killed Saturday afternoon in a head-on collision on Interstate 35 north of Denton. Authorities said an 18-wheeler headed southbound on the freeway between Valley View and Sanger crossed the median, crashed through a cable barrier and into the northbound lanes around 2 p.m., slamming into a Honda Odyssey minivan and killing its driver and passenger. The big rig — dragging the cable barrier along with it — started a small grass fire as it finally came to rest 15 feet from adjoining railroad tracks. The truck’s driver was taken to North Texas Medical Center in Gainesville, where he was pronounced dead. The names of the victims have not been released, but in a Facebook post published Saturday night, Melody Orr identified her father as the driver of the 18-wheeler. She said he had a heart attack while driving and lost consciousness. The accident resulted in a major backup on I-35, forcing the shutdown of all northbound lanes into Saturday evening. Workers faced a difficult problem untangling the barrier cables that were lodged in the truck’s wreckage. The southbound lanes were scheduled to traffic after 6 p.m. The cause of the accident is under investigation. August 17th, 2015. Houston, TX– A motorcycle rider is in critical condition after an accident on the Gulf Freeway late Sunday. According the Houston Police Department, it happened at about 10:30 p.m. on the Gulf Freeway near Clear Lake City Boulevard. At that time, a motorcycle rider was heading south on the freeway at a high right of speed, weaving in and out of traffic. Police said they are not sure how he lost control of his motorcycle, but they think he either hit the back end of an 18-wheeler or hit a bad spot in the freeway. The rider struck his head and was transported to the hospital in critical condition. August 20th, 2015 - Austin, TX– One person is dead after a multiple vehicle crash involving an 18-wheeler Thursday afternoon in Southeast Austin. It happened at around 12:45 p.m. near the intersection of Hwy 183 and Burleson Road next to Austin-Bergstrom International Airport. Austin-Travis County EMS says three people were injured in the crash and were transported to University Medical Center Brackenridge. Austin police says one of the crash victims has died. All lanes of northbound Hwy 183 are closed at the scene of the crash as police investigate. Only one lane of southbound Hwy 183 is open. Further details were not immediately available. We have a crew at the scene and we will update this developing story as we learn more. August 20th, 2015. Austin, TX— Two teenagers were killed after a crash involving a tractor-trailer and two pickup trucks at the intersection of U.S. 183 and Burleson Road Thursday afternoon. Police said shortly after 12:30 p.m. Thursday, a Toyota truck traveling westbound on Burleson ran a red light. The tractor-trailer heading north along U.S. 183 hit the Toyota, sending it into a Ford F-150 waiting to turn left onto Burleson Road. One person in the Toyota was ejected, and all three people in the Toyota were taken to University Medical Center-Brackenridge. The driver of the Toyota, identified as 13-year-old Johan Maldonado, and his passenger 16-year-old Vanessa Maldonado, died at University Medical Center-Brackenridge. The third person in the Toyota was seriously injured. Their name has not been released. The driver and passenger in the Ford were taken to South Austin Medical Center with non-life threatening injuries, and the driver of the tractor-trailer refused treatment. The road reopened to traffic around 3:40 p.m.
August 26th, 2015. Fort Worth, TX– A fatal collision involving three vehicles shut down Interstate 35W in Fort Worth early Wednesday morning, authorities said. Fort Worth police said an 18-wheeler, an SUV and a minivan were involved in the crash on southbound I-35W between Berry and Ripy streets just before 1 a.m. One person was confirmed dead at the scene, according to police. A woman was transported to a hospital, but her condition is not yet known. Southbound I-35W was shut down for several hours. Remember, if you are involved in a truck wreck, the first thing you should do is assess your health and call 911 if you or someone else involved in the accident has been injured. After making certain that necessary medical needs have been met, immediately call a lawyer from the Parker Law Firm. We specialize in big rig wrecks and will diligently seek all of the facts regarding the wreck to ensure that you and your loved ones are fairly represented and receive the compensation that you deserve. 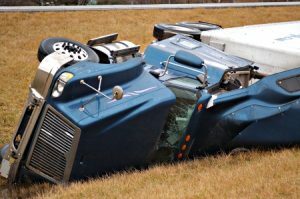 18-wheeler wrecks happen every day and the damage done almost always results in horrific and life long injuries, not to mention stacks of medical bills. It is our job to make sure that not only are those bills are paid but that those injured or the families of those killed be compensated adequately by those responsible. At the Parker Law Firm, people matter. We fight tooth and nail for the truth, and we will make sure that you are made whole so that you can move forward.